If you’ve recently invested in new window dressings for your home, you’ll want to keep them looking fresh and new for as long as possible. The good news about blinds and shutters is that with regular cleaning and maintenance checks they’ll keep fresh and bright, and in good working order. Here are some tips for looking after your blinds and shutters at home. Blinds are one of those window coverings that are often avoided as many people believe they are difficult to clean. Cleaning blinds is simple, and the more you look after them, the easier it will be! Cleaning and maintaining your blinds correctly will depend on the material and style they’re made in – for example, plastic, fabric, metal or wood. You can follow the cleaning steps below for all your blinds, however make sure you look also at the tips below that address certain blinds in particular. Use the brush attachment on your vacuum cleaner to remove any dust build-up. It is advised to also vacuum behind and underneath the blinds to reduce the chance dust sticking to the surface during the cleaning process. After you’ve done that, wet the soft cloth slightly with water or another gentle cleaning material and remove any particularly stubborn areas or stains. If your blinds are fabric-covered, spot-clean only – don’t use soap and water. For timber blinds, avoid using any chemicals. Simply dust with your vacuum as above, and wipe with a solution of soapy water and dry immediately, so that the timber doesn’t warp. For a quick clean, put on a pair of rubber gloves then cotton gloves on over them. Mix 1 teaspoon of ammonia to 1 litre of water. Dip your gloved fingers into the solution, then run your fingers along the top and your thumb underneath each slat. Easy! Like blinds, shutters are available in many materials, styles and finishes. How you take care of them will depend on whether they’re made from timber, polywood or aluminium. Follow the process below for all your home shutters, however when it comes to timber shutters, for example Basswood plantations, it’s best to keep things simple. You’ll want to clean them without using a lot of water or any harsh cleaning materials. 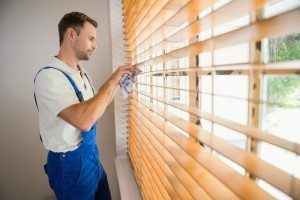 Polywood and aluminium shutters can be cleaned using more water and stronger cleaning products, but it can often be best to stick to plain old soapy water if in doubt! If your shutters are made from timber, make sure you dry off any areas you’ve wet to avoid any warping or damage to the surface of the shutters. If you’re unsure how to best look after your blinds and shutters, contact the experts in window coverings at Modern Blinds – they’ll be happy to help you out.